The leaves cost £2.99 each and the gel inside can be used to treat burns, scalds, rashes, skin irritations or sunburn. Not that sunburn is very likely at the moment! The coolness of the gel once it has been kept in the fridge is incredibly soothing. 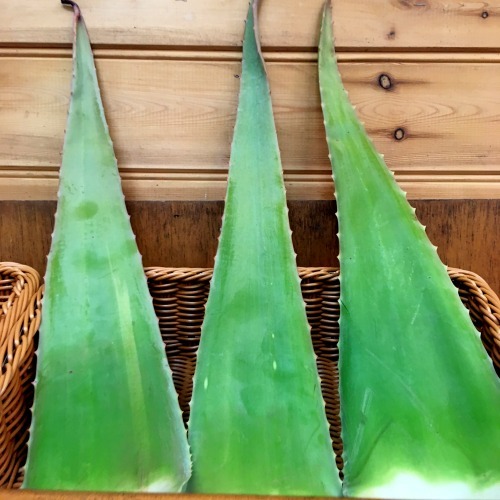 To harvest the gel cut off the tip and the spiked sides of the leaf. Open the leaf and scrape out the gel with a spoon. Put it in a glass jar and keep in the fridge for a week or so – or you can put the gel in an ice cube tray and freeze. Once frozen put the cubes in a freezer bag and just grab one as and when you need it. You can find all sorts of recipes online for skincare, scrubs, hair conditioners etc.